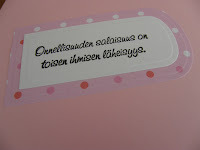 Kisoja katsellessa illalla tuli tämä tehtyä, ehkä keskittyminen ei ollut täydellistä! Not very happy to this card, but I show it anyway! It's a cute image and a great card. Hi! Such a cute pair of friends, and such pretty colours! Thanks for joining us at Cupcake and good luck! Awww this is so-o-o sweet, love the adorable image and the colouring! Your colouring is great and those flowers are perfect! We love seeing your card each week and appreciate your ongoing support for the Midnight Madness Sketch Challenge - we hope to see you again next week! How fun and fabulous and totally yummy. I love the way you did your slanting panels and your flower embellishments. What a pretty card. Thanks for playing along with us at the Midnight Madness Sketch Challenge. What a fun card...Love your take on the sketch :) This is just a yummy card no matter how you look at it :) Oh I just wanted to let you know to mark your calendar for March 5th because that is when the Midnight Madness will be doing a huge giveaway. It will be a blog candy style with comment entries only. No card making on this one, but I really do not want our regular players to miss out on the opportunity to win. You will not be sorry you entered. As always, thank you so much for playing the Midnight Madness sketch challenges with us. We really love checking out all our entries work each week. 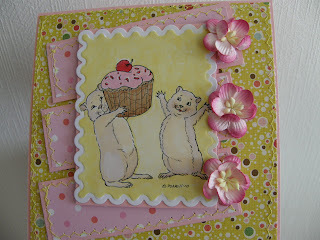 Pretty pastel colors and that yummy cupcake make this card so nice. Flowers are a great touch too. 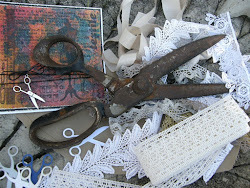 Thanks for sharing your take on the sketch this week at Midnight Madness Sketch Challenge. Wow such a lovely creation. Oh how cute!! Love your image and the colors! Awesome coloring and take on the sketch!! Thanks for joining us at Midnight Madness this week! !